2019 has been chosen as Vietnam’s Safety Year for Women and Children by the Vietnam Women's Union (VWU), aiming to build a safe environment for women and children to reach their full potential and mobilise the whole society to act together for their safety. 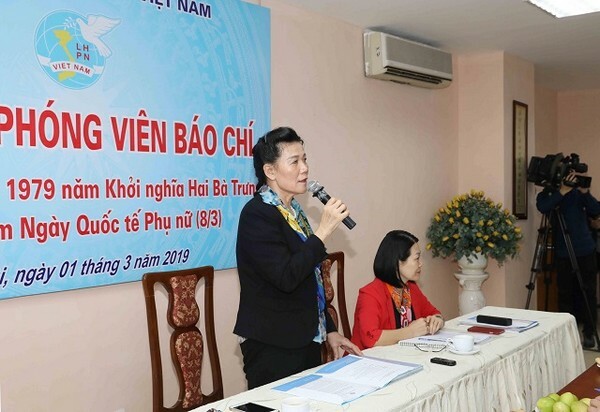 The information was announced by VWU Vice Chairwoman Nguyen Thi Tuyet at a press brief held by the union in Hanoi, on March 1, to provide information on the activities in celebration of the 1979th anniversary of the Trung Sister Uprising and International Women's Day (March 8). According to Tuyet, safety for women and children is a cross-cutting theme that has been implemented over many years, contributing to the realisation of sustainable development goals, the millennium development goals and the national strategy on gender equality during 2011-2020. The programme will focus on three main contents: safety for women and children in the family; safety for women and children in public places, in response to climate change and in the network environment; and food safety and hygiene. Tuyet informed that the 109th anniversary of the International Women's Day and the launch of the Safety Year for Women and Children will be held online simultaneously in Hanoi and Ho Chi Minh City on March 6, featuring various activities related to safety for women and children. In addition, a range of activities on the theme will also be organised through March, including the 2018 Kovalevskaia Award Ceremony and an exchange between female scientists and students scheduled at Hanoi Medical University on March 4. The VWU will also coordinate with the Ho Chi Minh Communist Youth Union and UN Women to organise a dialogue with students on gender equality and safety for women and children at Hanoi Law University on March 13, in addition to a range of other activities to celebrate International Women's Day.